Before seeing Divergent I was excited to see how they've pulled the world of Divergent together, but not jumping-out-of-my-skin excited. That changed the moment the lights went down in the theater. 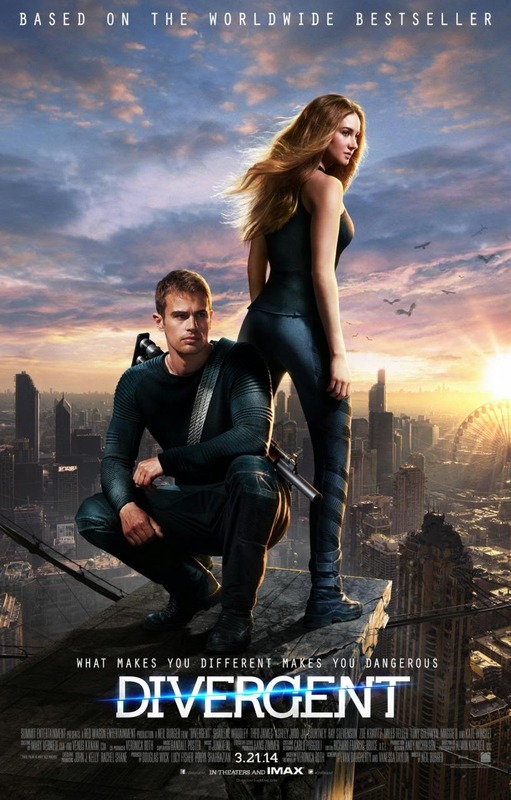 The second the movie starts it transports you to the world of Divergent, completely immersing you in the story. And, I can say, I'm now jump-out-of-my-skin excited to watch it again! I read the book a long time ago, so I don't remember all of the details, but it didn't matter. This wasn't one of those adaptions that was made for the fan-base and leaves everyone else scratching their heads. Dystopian Chicago and all of the factions were perfect and the details of the world came across easily, allowing viewers to enjoy the movie without wondering who this group is or why they act the way they do. I've only read book one, my sister read all three just a month ago, and our friend hasn't read any of the books yet. But we all came away feeling the magic of Divergent. And I think we may all have to either read or re-read the series now. I have to say, possibly my favorite part of the movie was when Tris is about to do the zip line and Veronica Roth is standing on the roof next to her. Seriously, that was the greatest author cameo I've ever seen. Veronica is just so cute and she fit in perfectly with the rest of the Dauntless! As far as I'm concerned, Divergent is the best YA adaption I've seen so far. Catching Fire was a great adaption, but Divergent blew it away. So bring your friends, your boyfriend, your parents! Everyone will walk away wanting more Divergent. Oh good, I've been dying to ask someone who's seen the movie if the scene with Edward's attack is in there? If it is there's no way I could handle seeing it, that scene traumatized me in the book! Anyways, I'm glad you enjoyed it!! =) That's so cool that Veronica Roth had a cameo. There is an attack, but it's done very well. It wasn't too bad. I remember the attack being much much worse in the book. I was expecting something intense, but it was just a quick scene. I don't remember the book that well though, so I'm not sure if I'm remembering the attack scene wrong or not, but in the movie it wasn't bad. I went to see it yesterday =) That one scene is honestly like the only thing I can remember from the book. Go figure. Thankfully the part I was worried about wasn't in the movie, they had him hang himself instead. At least I think that was Edward, they didn't do a good job of introducing the side characters. Hope you enjoyed it! Glad the part you were worried about wasn't in there. I went to see it again today and I thought it was just as good the second time. Great review!! It only starts here next week. I cannot wait! Glad you enjoyed this and glad that most readers seem happy with the adaptation. I'm apprehensive to see what they do with the next two books, because I didn't like them as well as the first, but maybe the movies will be better!